One of only four Palm Beach estates with an enviable Worth Avenue address, this 5,632+/- total square foot, 3-story residence was designed by noted Palm Beach architect Roger Patton Janssen and beautifully crafted in 2008 by Benitz Building to take full advantage of its water views. With incomparable views of the Intracoastal and Everglades Club golf course beyond from all major rooms, and such compelling features as a comprehensive full-floor master suite, three gracious guestrooms, 5 impeccable limestone and/or marble mosaic baths, 2 half baths, marble flooring and African Wenge wide plank wood flooring, hand-painted frescoes in the Canaletto style, lightly detailed plaster crown and ceiling moldings, this residence is a visual delight. Fashioned for simplicity and security, the house is storm-proofed down to its stairwell stained glass window, and includes reinforced concrete construction, dual waterproof roofing system, custom high-impact casement windows and doors, gas fireplaces, integrated audio/video system, gourmet island kitchen including refrigerated storage for 1,000 wine bottles, convenient third floor laundry, elevator and security system. With its sublime coquina courtyard, tranquil orchid garden, waterfront veranda, entertaining loggia with cypress plank ceiling, salt-filtered heated pool/spa with fresco and fountain, and unexpected 2-story guesthouse, this residence is a rare find. One that embodies both Venetian ambiance and Palm Beach charm. Worth Avenue, Palm Beach, Florida. This in-town home fronts Worth Avenue, with a double garage entered from Peruvian Avenue. Literally located just a block from Worth Avenue's world-class dining and designer shopping, it is also minutes from Royal Poinciana Plaza's midtown shopping, and a mere 4+/- miles from Palm Beach International Airport. Award-winning golf and tennis facilities abound nearby. Social and charitable events occur at The Breakers and Mar-a-Lago Club, Flagler Museum and Society of the Four Arts Museum & Gardens. Private banking institutions line Royal Palm Way. 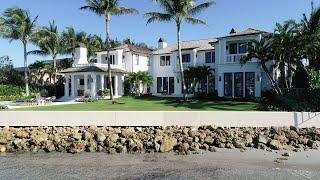 A stucco wall with locking gates and privacy hedges surrounds this manicured waterfront property with mature tropical landscape. Ideally sited on its palm-studded 1/4+/- acre lot, the living room, library and master bedroom directly front the Intracoastal. An orchid garden and intimate courtyard terrace connect to a heated pool/spa with fountain and fresco through a covered loggia ideal for entertaining and alfresco dining.